For two thousand years Christianity has been an operative force in the world; for more than a century democracy has been the controlling influence in the public affairs of Europe and the Americas; for two generations education, free, general and comprehensive, has been the rule in the West. Wealth incomparable, scientific achievements unexampled in their number and magnitude, facile means of swift intercommunication between peoples, have all worked together towards an earthly realization of the early nineteenth-century dream of proximate and unescapable millennium. With the opening of the second decade of the twentieth century it seemed that the stage was set for the last act in an unquestioned evolutionary drama. Man was master of all things, and the failures of the past were obliterated by the glory of the imminent event. The Great War was a progressive revelation and disillusionment. Therein, everything so carefully built up during the preceding four centuries was tried as by fire, and each failed—save the indestructible qualities of personal honour, courage and fortitude. Nothing corporate, whether secular or ecclesiastical, endured the test, nothing of government or administration, of science or industry, of philosophy or religion. The victories were those of individual character, the things that stood the test were not things but men. The "War to end war," the war "to make the world safe for democracy" came to a formal ending, and for a few hours the world gazed spellbound on golden hopes. 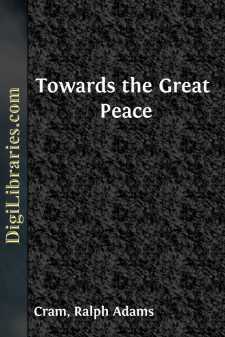 Greater than the disillusionment of war was that of the making of the peace. There had never been a war, not even the "Thirty Years' War" in Germany, the "Hundred Years' War" in France or the wars of Napoleon, that was fraught with more horror, devastation and dishonour; there had never been a Peace, not even those of Berlin, Vienna and Westphalia, more cynical or more deeply infected with the poison of ultimate disaster. And here it was not things that failed, but men. What of the world since the Peace of Versailles? Hatred, suspicion, selfishness are the dominant notes. The nations of Europe are bankrupt financially, and the governments of the world are bankrupt politically. Society is dissolving into classes and factions, either at open war or manoeuvering for position, awaiting the favourable moment. Law and order are mocked at, philosophy and religion disregarded, and of all the varied objects of human veneration so loudly acclaimed and loftily exalted by the generation that preceded the war, not one remains to command a wide allegiance. One might put it in a sentence and say that everyone is dissatisfied with everything, and is showing his feelings after varied but disquieting fashion. It is a condition of unstable equilibrium constantly tending by its very nature to a point where dissolution is apparently inevitable.